A solar panel is made up of different components as seen in Model 2.1.1. Not all panels will have these specific components in the specific locations, but generally our panels have this. Solar Cell (2.1.1.6): The solar cells can be seen on front of the solar panel. They vary in color and appearance based depending on the type of cell. The type of cell generally defines what kind of panel it is, for example monocrystalline, polycrystalline, amorphous, etc. Frame (2.1.1.5): MostRenogy Solar panels have an aluminum frame, but depending on the type of panel frame type can vary. Junction Box (2.1.1.1): The junction box is generally located on the back of the panel. It contains bypass diodes to help with power loss due to shading. Also it serves as a connection and a holder for the panel wires. Wire (2.1.1.3): Our Renogy solar panels come with standard PV wire that is weatherproof and insulated (as long as there is no exposed copper wire). MC4 (2.1.1.4): At the end of the PV wire is a MC4 connector. This MC4 connector is standard in the PV industry, is weatherproof and serves as a connection point to our other MC4 cable, such as an adaptor kit. Specification Sheet (2.1.1.2): The panel’s specification sheet will tell you the electrical characteristics of your solar panel. It is very important when sizing systems. Monocrystalline solar panels are slightly higher in efficiency than polycrystalline panels because each utilizes a different manufacturing technique. A monocrystalline cell consists of a single crystal ingot, whereas a polycrystalline cell consists of a growth containing multiple crystal structures. Both types of cells are made from silicon ingots, but the purity requirement of the silicon is higher on a monocrystalline base. 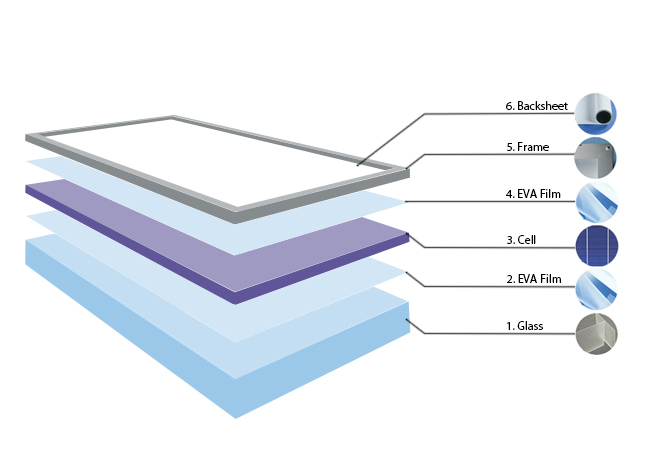 Therefore, monocrystalline panels are more efficient, and thus, more expensive. By using a single cell, monocrystalline based silicon allows the electron greater freedom to move, so less energy is lost and higher efficiency is created. Most monocrystalline cells peak at 22% efficiency, whereas most polycrystalline cells peak at 18% efficiency. Monocrystalline cells are a dark blue almost appearing black, and polycrystalline cells are blue. Even though this is true, there is a common misconception that monocrystalline solar panels will actually perform better than polycrystalline panels even in situations where they have the same wattage. This is not true. A 100W Mono Panel should perform just as well as a 100W Poly Panel, assuming the electrical characteristics are very close. A customer’s decision should be based on the price, the dimensions, and the color. Also due to common misconception, Poly and Mono panels should perform the same under low light conditions. They also should perform the same under high temperatures. It is important to use the peak hours with the wattage of your system to calculate how many watt hours your system produces in a day. You can view peak sun hours as an average, as basing power off the hours of daylight during the day isn’t sufficient. The reason why is because sunlight in the morning and evening will not produce as much radiation as solar during midday. To calculate each states peak hours, the radiation is averaged based on the highs and lows and also other factors such as what is mixed into the atmosphere. As you can see from the data gathered Model 2.1.2, the level of irradiance or W/m2 varies throughout the day. The panels output is directly related to the W/m2 at that given time. Most solar panels are rated at 1000 W/m2. If the irradiance level is let’s say 500 W/m2, like it is at 8am in the graph, then you should expect half the output (50%). Because of this fact, the solar peak hours of your state isn’t how long the sun it out, but an average from the lows and the highs so that it can be a reliable number in calculating energy generation. Panels come in compatibility of 12V and 24V, and you can wire them in various ways stay at 12V or wire them up to reach higher voltages. These methods are called series and parallel connections (which we will go into more later). A series connection will keep the amps the same, but increase the voltage. A parallel connection will keep the voltage the same and increase the amps. Although we signify a panel as “12V”, the panel doesn’t actually produce 12V. The voltage the panel produces is greater than 12V, but this is necessary in order for the battery to charge. Batteries must be charged at a higher voltage than what they are nominally, as electricity will travel from higher voltage to lower voltage. How you end up wiring your panels depends on the voltage of your battery bank. The voltage of your panels need to match the voltage of your battery bank in order for it to charge properly (with the exception of the MPPT controller which we will discuss later). Most RV and Boats have 12V battery banks, so usually customers stick with the 12V panels in order to be compatible with these batteries. Max Power at STC: This is how much power the panel is rated at the Standard Test Condition, which is 1000 W/m2. Open Circuit Voltage (Voc): This is the panel’s voltage level when it is not hooked up to a controller and battery. It is important when sizing systems with controllers as panels will have this value for a short period of time when the system is hooked up. Also, this is important when troubleshooting a solar panel. Operating Voltage (Vmp): This is the voltage level of the panel when it is set up and operating. This is important for calculating wire gauge size and wire length. Operating Current (Imp): This is the current being produced when the panel is set up and operating. This is important for calculating wire gauge size, wire length, and controller sizing. Short-Circuit Current (Isc): This is the panel’s voltage level when it is not hooked up to a controller and battery. This is important when troubleshooting a solar panel.